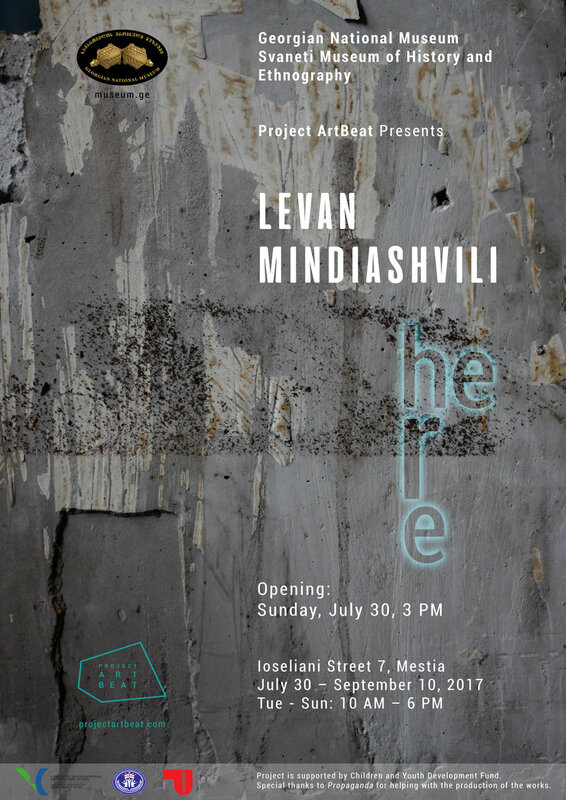 Georgian National Museum and Project ArtBeat present "here" ˗ a solo exhibition of New York based Georgian artist Levan Mindiashvili at the Svaneti Museum of History and Ethnography. Transitional state of today's world in yet unknown future and fragility of all possible paradigms, notions or values are conditions, central in Mindiashvili's practice. Physical nature of his chosen materials and interdisciplinary approach in execution highlights in-between, temporal conditions and question the mechanisms of our perception: pigmented plaster sculptures mimicking found concrete remnants adhere painterly qualities with neon lights of various colors, while paintings, executed in acrylic, at first glance look very alike to pixelated, vintage photographs, are transformed into three dimensional objects. All together, they create an installation where architectural and natural elements outline the fluid, cyclical nature of the universe and attempt to capture a physical experience of ever-flowing present - of "here" and "now". Levan Mindiashvili holds his BFA in sculpture from Tbilisi State Academy of Arts and MFA in combined artistic languages from The National University of Arts of Buenos Aires, Argentina. Among his awards are Commission Grant for Public Art Projects from National Endowments for Arts, New York, 2014 and Emerging Artist of 2011, Movistar Arte Jóven, Buenos Aires, Argentina. Currently he is a guest teacher at Free University of Tbilisi - School of Visual Arts and Design (Georgia). His works had been included in recent group exhibitions at Contemporary Art Gallery - Georgian National Museum (Tbilisi, Georgia), Mystetskyi Arsenal, (Kiev, Ukraine), Tartu Art Museum (Tartu, Estonia), The Lodge Gallery (New York, USA), Literature Museum, (Tbilisi, Georgia), Clemente Soto Center (New York, USA), ODETTA (Brooklyn, USA). His recent solo exhibitions include State Silk Museum (Tbilisi), The Lodge Gallery (New York), The Vazquez Building (Brooklyn), Kunstraub99 (Cologne). The exhibition is organized by the Project ArtBeat. The project aims to promote contemporary Georgian art worldwide and also to foster cultural activities within the country. Project is supported by Children and Youth Development Fund and non-profit art organization „Propaganda". Opening of the exhibition will be accompanied by the Q&A with the artist. Address: Svaneti Museum of History and Ethnography, 7, A. Ioseliani Str. Mestia, Georgia.